Over the years in Lotumbe we have provided farming training, tools and fast growing seedlings to improve health and wellbeing. Villagers now have community gardens, duck raising enclosures, beehives, more fruit trees and a community store. At present the community of approximately 3000 people identified food security as its top priority. They prepared a list of items that would improve life, including an industrial grinding machine for cassava to replace mortar and pestle saving hours of work. Traditionally the Lotumbe villagers are fisher folk and hunter gatherers. They rely on cassava root as a staple. The Lotumbe hospital is the only general reference hospital in the rural health zone and services over 80,000. Many travel for days by canoe or walk on forest paths to receive medical care. This is a 'full service' hospital that provides surgical, orthopaedic, obstetrics, family planning, AIDs and Ebola treatment. 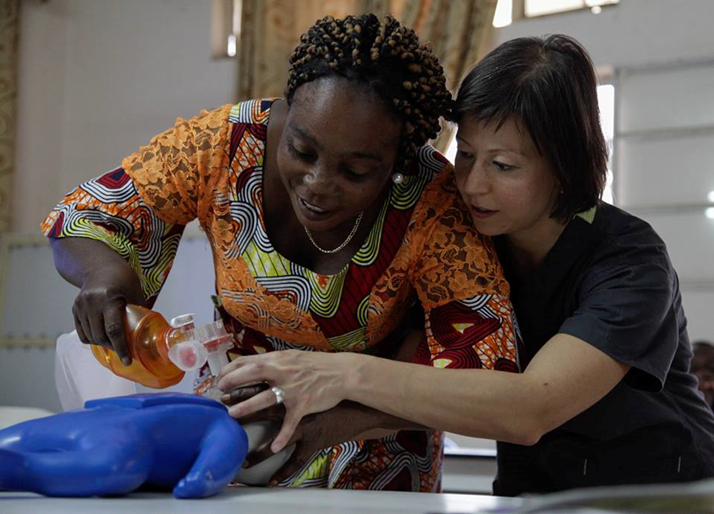 In conjunction with Pink Umbrella, DAK Foundation, UNSW Medical Students' Aid Project and others, HandUp Congo has provided funds for latrines, mattresses, medical equipment and training. As their contribution to hospital improvements, the local women also made medical uniforms using the cloth and sewing machines we provided. The patient's family is responsible for bathing, feeding, laundry and cleaning. Barter is an accepted way of paying for hospital care. You are not discharged until your bill is paid. Healthcare teams at rural hospitals including in Equateur Province jumped at the chance to have emergency medicine and family planning education. Doctors and nurses travelled to the provincial capitol and also to Lotumbe by canoe, motorbike and on foot to participate in training and to receive donated medical equipment, eyeglasses and contraceptives. HandUp Congo facilitated this training in 2015, 2016 and 2017. Photo to the left is of Dr Vera Sistenich (r) with Blandine Diangemba at IME Kimpese Hospital. There are now two groups of Microcredit Mamas, more than 60 women, who are earning enough money to pay for school fees, medical care and solar panels. Lotumbe women have been educated in a savings-based microfinance project model which now includes an expanding number of borrowers as loans are made and repaid with interest thereby growing the fund. The model works and is replicable. In 2017, HandUp Congo supporters purchased a motor for the Lotumbe Microcredit Mamas enabling them to to access multiple riverside markets to sell handmade soap, bread, manioc and more - saving them many hours each day. More canoe motors, bicycles and motorcycles would make an enormous difference to many! Selling duck eggs can pay for school tuition and uniforms. More Pygmy orphans are enrolled in school via the duck and fruit tree raising initiative. The goal is to sell eggs and fruit to cover the cost of the Pygmy orphans’ tuition and uniforms. Pastor Entonto (left) works with the entire community on capacity-building projects that are prioritised by a management committee. His salary is made possible by ICA Australia. "Debout Lotumbe" (Stand Up Lotumbe) is the community's capacity building management team that identifies needs and works with HandUp Congo to make things happen. 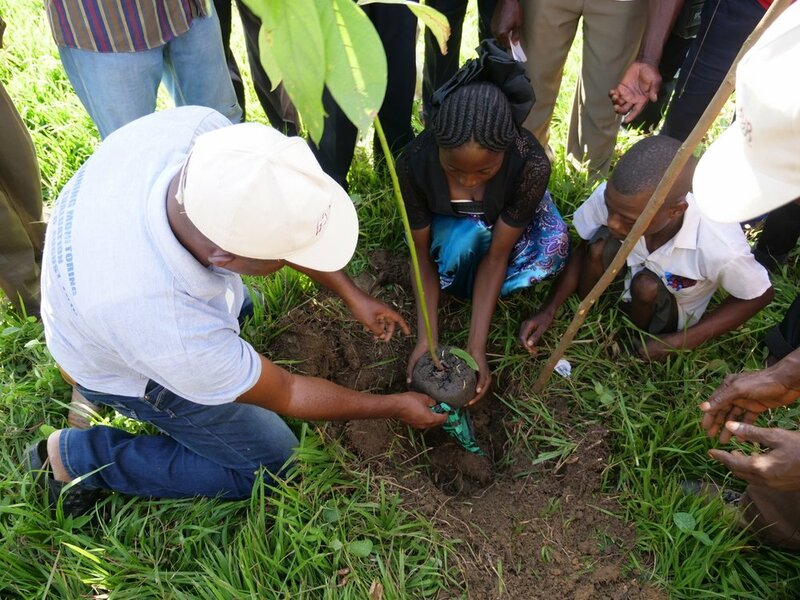 In 2017 Lotumbe school children planted 50 bee-friendly fruit and palm trees as a climate change and community service reforestation project. Lotumbe is located in the world's 2nd largest rainforest, after the Amazon. Deforestation is occurring due to large numbers of displaced people cutting down trees for shelter and fuel. This project was supported by Rotary E-Club of Greater Sydney (District 9685) in collaboration with Rotary Ekanga Mbandaka (District 9150). In 2006, the first community garden was established. 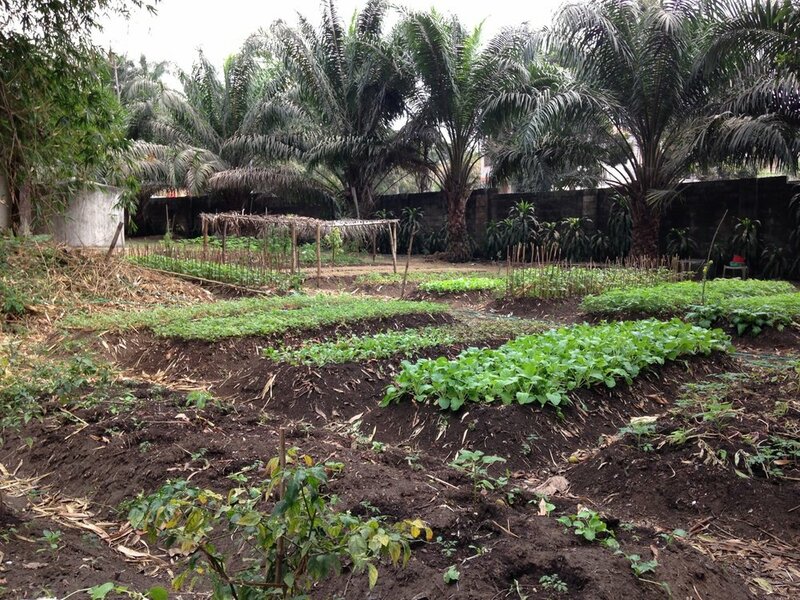 HandUp Congo has provided funds for tools and training while land was donated by the community. Food security is now a bit easier for Lotumbe’s vulnerable widows and young single mums. A communal library has been established as a resource for the teachers of Lotumbe's seven schools. With your help, HandUp Congo aims to provide funding for more books for teachers and children. One book costs $12. The Ministry of Education determines school curriculum and reading lists. Ideally we would love to fund a printing press! This would enable the printing of original hymnals and schoolbooks which deteriorate quickly in the tropical heat. Soccer balls and jerseys make a difference too! Football Federation of Australia has supported HandUp Congo with both. Sport is uniquely effective in improving health, fostering social inclusion, interaction and cohesion - and gender equality. Participation in quality physical activity significantly reduces the risk of developing Non Communicable Disease (NCDs). Sport provides safe and supportive community spaces for women and minority groups in developing countries who are at an increased risk of experiencing violence. Sport provides governments and public health organisations with a mass audience platform to deliver high-impact messaging on health issues (e.g. HIV/AIDS, tobacco and alcohol). Over the years we have built school benches and provided funds to rehabilitate tornado-damaged school buildings. At the request of the community, HandUp Congo has also provided pre school toys, cloth for school uniforms and funds to buy schoolbooks and pay for pre school teacher stipends and Pygmy orphan tuition. 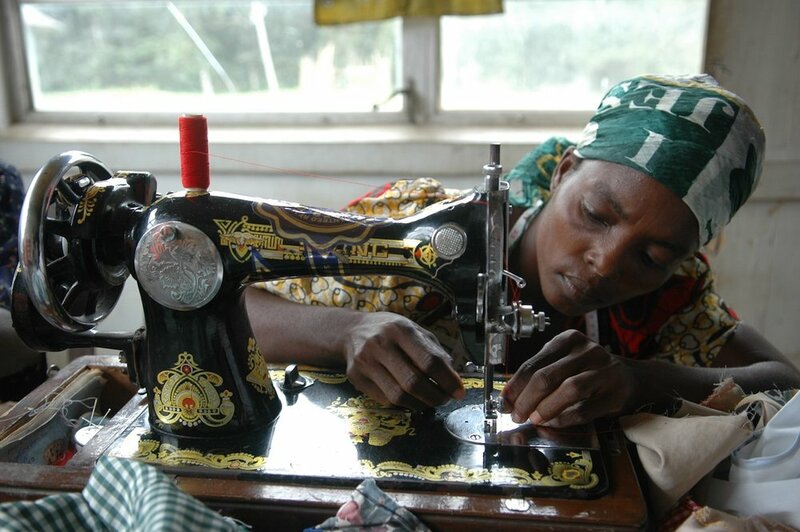 In 2005 we provided funding for a sewing machine and material. In return the local women sewed the school uniforms. Great teamwork! HandUp Congo's Emergency Medicine Education Project leader, Dr Vera Sistenich, is also a hobby apiarist. She identified the opportunity to introduce sustainable beekeeping. The locals were burning down trees to access honey. With HandUp Congo's help they have had training from Congo's Beekeeping Association (PLAAC) and now have the equipment and skills to retrieve honey from trees and build their own hives. Vera has enthusiastically championed this new social enterprise in Lotumbe - and even produces sells Australian honey to benefit this initiative. Learn more. Lotumbe has the only store for 100's of kilometres. 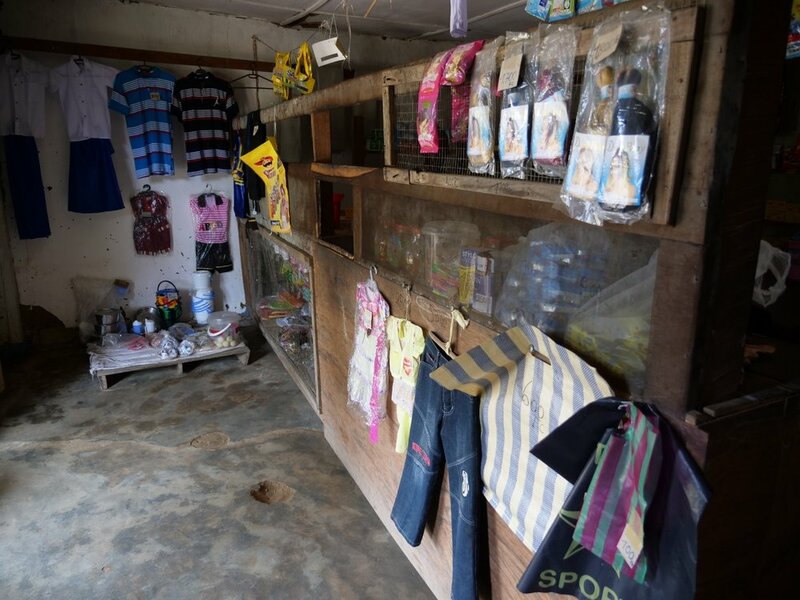 It sells everything from batteries to combs, cooking oil to cloth, tinned food to school notebooks. With help from supporters, HandUp Congo built the store and provided seed money for merchandise. In Lotumbe there is no optometrist and nowhere to buy eyeglasses. And no one has the money. Every year HandUp Congo volunteers carry used, good condition eyeglasses with them to Lotumbe. The hospital staff facilitates dispensing them. Lotumbe has 13 residents who without wheelchairs are isolated and confined to home. With wheelchairs they can attend school, socialise and run a business. Most of these people are polio victims. In 2018, we purchased 2 wheelchairs for Lotumbe (made in Kinshasa) with a Rotary E-Club of Greater Sydney district grant for US $500 each. That's a good start. It takes $500 USD ($800 AUD) to facilitate the purchase and delivery of a wheelchair to Lotumbe. This is a relatively new project for us. We have seen the impact that solar panels have on entrepreneurs, school children and community leaders in Africa. We aim to build on this with our project colleagues.